I LOVE the Tatsu picture. It looks like he's playing the world's most serious game of "got your nose." The latest piece is one of the Nickelodeon turtles! Very cool. You put the logo in there just so everyone knew it was Nickelodeon? Anyway I like it a lot. I suppose you could say that, in design (or at least how they came out) there isn't much to differentiate them from the 2k7 TMNT. I finally got around to coloring this Jim Lawson commission I got in '09. I like how you've used the glow pattern on the leaking pipe in the background. Nice artwork man. Thanks for sharing. I'm guessing its a story based on the spiritual plane, starring Leo. In which he makes contact with his dead sensei, Splinter. Or something! Nice colors on the Jim piece, looks great! Wow! This is fantastic!!!! I think I would love this hanging on my wall. One thing I'm not too keen about is the colored straps on the weapons. Still, I think the turtles look amazing. I even love how you remember the color of the foot wrappings on each turtle. I have the comic of Splinter's funeral, and the way Leo is drawn looks like the one from the issue. This must be Jim Lawson. I don't care if they were red masks in those comics. The warrior looks better in blue. I even like the accessories in front of him on the table. Oh yeah, and I love the ooze coming down in the background. Just a quick question: How do you get your pictures on like that without having the troulbe of filling up your files? Do you link the pictures from deviantart? How do you do that? Haha, that mock-up is crazy, Tookie! I just finished this bad boy after watching my favorite OT episode "The Cufflink Caper". Like I said on your DevArt account, Powder, that Cufflink Caper homage brings a smile to my face! Just finished this sucker here, well, coloring it. 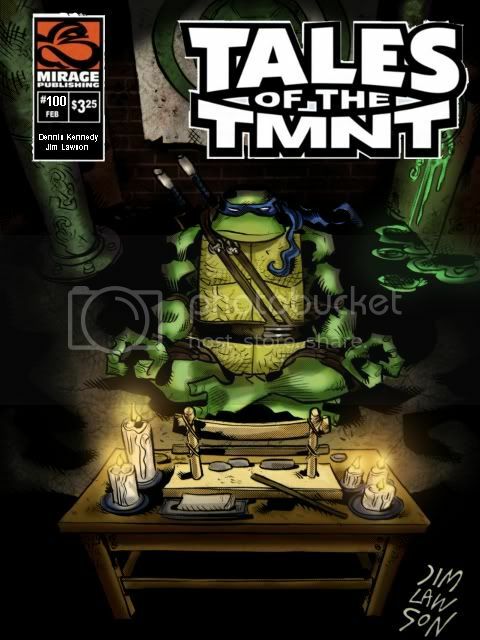 Leonardo was drawn by the great Kevin Eastman (in 2011, this year! Whoooooo! New art! ), and the background etc. 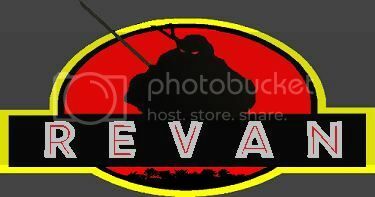 I made in photoshop. I think it came out sick as hell, won't lie. Gracias, I had a blast coloring it. I will likely do another of his soon, he put a bunch of new art on his website. awesome work!! this tablet you work on, what software does it run? and if you dont mind me asking what does it set you back. I love your gritty color style, Powder! I'm making good progress on my fan comic (I'm in the process of coloring it myself, woohoo! ), but I'd like to get your opinion/advice on some coloring strategies. Would you mind if I sent you the first four pages in the next couple of days for you to examine? Thanks, it can run with virtually anything from Microsoft paint, to Photoshop. I think I paid 80$ including shipping & a 2 year warranty. Sure thing dude, shoot 'em to my email addy.